I’m writing about this for my resin jewelry making blog because no matter if you're buying metal jewelry or resin jewelry—when it comes to jewelry that incorporates metal in any way, I recommend .925 sterling silver above all else. For jewelry wearers and jewelry makers alike—sterling silver is an amazing option for many reasons. Let’s dive in, shall we? (Scroll to the bottom of this post for a handy chart to quickly compare sterling silver against other options). .925 sterling silver, sometimes just called sterling silver, is 92.5% silver. So, what is that other 7.5%? Why isn't it solid silver, wouldn’t that be better? Technically, “solid” silver IS .925 sterling silver. If it was actually 100% silver, it wouldn't be strong enough to make into jewelry. It would be too soft. So, 92.5% silver is the most “solid” we're gonna get. The other 7.5% is an amalgam of other metals to strength the silver. But then, why not just silver plated? Why not gold? Okay, if you prefer gold, that's great. Go for it. But gold is an expensive option. Gold-filled is more affordable, but it doesn't last as long as sterling silver—which is even more affordable (gold-filled is 100 layers of plating while sterling silver is silver allllll the way down. Deep inside gold-filled is a base metal that isn't as gorgeous as the 100 gold layers on the outside). Other options are great, too, like solid copper and solid brass. Even more affordable and also long-lasting, BUT they’re generally not as shiny or pretty as silver. So, in terms of affordability and long-lasting-ness, sterling silver is your best friend. For rings especially, since they often receive the most wear-and-tear. Silver tarnishes to dark grey/brown or black if it’s extremely tarnished. But, that doesn't mean it's not good quality! When exposed to oxygen and the oils on our skin, it will naturally tarnish. That's just what it does. Polishing every once in a while, or wearing daily, will fix that issue. Either way, as layers tarnish we need to remove them to reveal the fresh shiny layers beneath. More on that in a minute. Now, if the silver was plated, once it tarnishes to black and is rubbed off the base metal underneath will be exposed. There will be no more silver layers beneath and the only fix is to get the jewelry re-plated. But with .925 sterling silver, the tarnish can be easily removed to expose endless layers of more shiny silver underneath. This is not to say that all plated jewelry is worthless. I have some plated jewelry I own that was coated in enamel and hasn’t tarnished in years. But, it’s just not the most reliable option—and often we don’t know if the plating is covered in a protective enamel or will wear down within a month—this is not often disclosed by jewelry manufacturer’s. So, when it comes to a ring you're going to wear everyday (and maybe not feel like taking off every time your wash your hands) if it's sterling silver, it's going to hold through with you so long as you take care of it. It'll always come back to life. So you haven’t worn your piece for a while and you didn’t keep it in an air-tight baggie or box. And your piece lost it’s luster—what do you do? The first line of defense against tarnish on .925 silver is a microfiber cloth. I recommend an untreated, microfiber jewelry cleaning cloth (untreated means no added polishing compounds). Using the cloth, rub the silver and watch the shine return! In extreme cases you may need to use a mild dish soap and warm water along with polishing, or even a bath in a vinegar/baking soda mix—but that’s for really bad tarnish. 99% of the time, a cloth will do the trick. Click the image to visit an article on how to remove extreme tarnish (not ideal for resin jewelry, by the way). A cloth may not be able to get the inner sides of a chain, but it can polish up the outside. 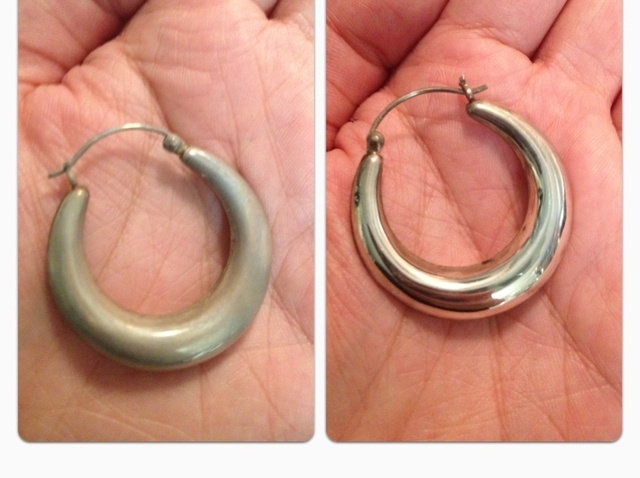 Did you know that often tarnish is use on purpose to give depth to silver jewelry? The tarnish can emphasize designs and make the shinier parts stand out more. What does taking care of sterling silver actually mean? It means keeping it nice looking. When not wearing it, keep in in an air-tight baggie or box to prevent tarnish. When you wear it often, you probably won’t need to polish it because the tarnish will rub off gradually as you’re wearing it. Also, you can wash your hands with your sterling silver rings on (though it’s not recommended . . . but I still totally do it) and get away with it. Your ring won’t really suffer because of it. Beyond polishing it, caring for sterling silver also means keeping it away from sharp objects that can potentially scratch the silver (it’s strengthened with an amalgam of other metals, but still soft!). Besides that, it’s pretty low-maintenance. Click here to read my post on how to care for jewelry in general, with specifics in regards to resin jewelry. .925 sterling silver, or just .925, is often stamped onto work that is sterling silver. If you can’t find it, you can ask whoever made it if it was sterling silver. Trying to polish it is another option—but if it isn’t sterling silver it, polishing will just remove the plating and look dull. Ultimately, when purchasing jewelry, jewelers will want you to know that you’re buying sterling silver and will mention it in the description or on the packaging. Besides silver plated, there is silver-filled jewelry. Similar to gold-filled, silver-filled is 100 layers of silver plating. Here’s a visual look at sterling silver vs. other options (click the zoom in on the chart). Whether You’re Buying or Making . . . Whether you’re buying finished jewelry or making your own jewelry, .925 sterling silver is a fantastic option for both you and customers. At the end of the day, the most important question is does you or someone else want to wear the piece because they enjoy it? And then the next question is, what’s the best deal in terms of long-term use and affordability? Even if an item won’t last long and is cheap or expensive—if you truly love it and will enjoy it while it lasts, there’s no one saying you can’t go for it anyway. And if you’re willing to pay more for gold, or sacrifice the beautiful silver shine for a different color—there’s other options to suit your wants. Tell me in the comments, do you prefer silver or gold? Do you have any .925 sterling silver jewelry? Are you a jewelry maker? Have you taken my free Resin Jewelry Basics course yet? Well, get in there, then! You’ll learn the basics of what it takes to make resin jewelry. With access to a recorded class, a supply list, and other resources you’ll be on your way in no time. You in?